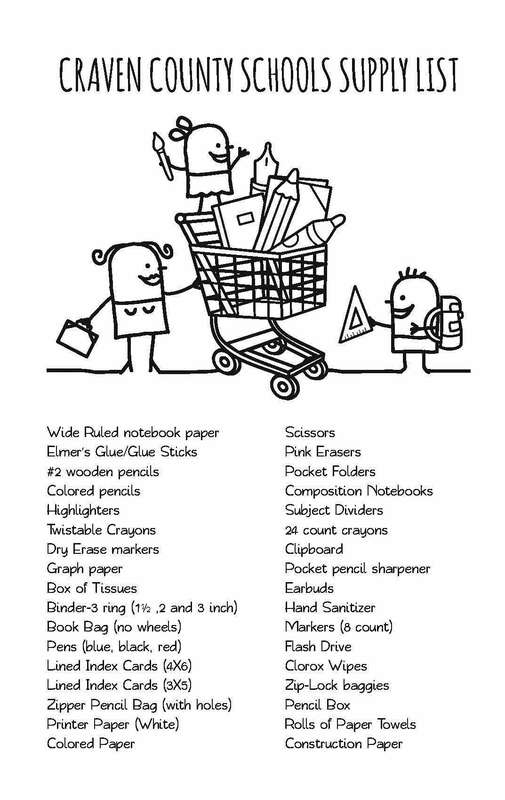 As school begins, school supply lists are made available to students and parents, but not all students are able to arrive the first day of school with the items required to put them on the road to success; some parents simply can’t afford to purchase the items needed. To assist those students, Partners In Education (PIE), in partnership with Craven County Schools will have bright yellow school buses and colorful totes set up in front of the three Walmart Stores in Craven County on August 19, 2017, from 10:00 am – 2:00 pm (New Bern – 3105 Dr. M.L. King, Jr., Blvd. and 2915 Neuse Blvd., and Havelock – 566 U.S. 70). Generous shoppers can donate school supplies for students who have been identified as in-need by their school counselors. Volunteers from the schools and our community will be on hand and honking the horn of the school bus each time a donation is made as a way of showing thanks. A shopping list will be available the day of the event, is currently available on the PIE website at www.CravenPartners.com, and is listed on the individual schools’ websites. Chevrolet of New Bern, 3405 Dr. M.L. King, Jr., Blvd. Craven County Schools at 3600 Trent Rd. Last year, through the generosity of our community, Partners In Education received $24,900 in donations and was able to assist over 611 students. Based on this success, Partners In Education is recruiting the help of all our community partners so that we are able to reach even more students this year. For more information about this event, or how you can support PIE, contact Darlene Brown at 514-6321, or at Darlene.Brown@CravenK12.org. Partners In Education is an educational foundation that provides grant funding and special programs to classrooms and schools within the Craven County Schools system. Since 1988, PIE has been changing the lives of students and families in our community. This entry was posted on Wednesday, July 19th, 2017 at 7:55 pm	and is filed under Events, News. You can follow any responses to this entry through the RSS 2.0 feed. Both comments and pings are currently closed.